Yesterday here in Australia our Children’s Book Council announced the Notable books for 2016. From this list a short list will be announced in May and then during Book Week in August the winners will be revealed. This is quite a different process from past years and means I have an enormous pile of books to read. I probably won’t talk about all of these books. Some are for a younger audience and some don’t especially appeal to me but I did pick up a selection from school today. 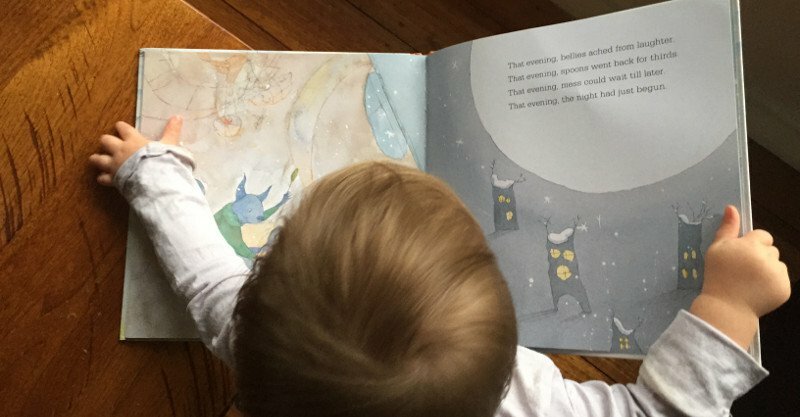 In the evening is on the Picture Book of the Year list. At first glance this book seems better suited to the Early Childhood category but on further reading I have changed my mind about this. The lyrical language, emotional arc and relationship of the artwork to this Emily Dickinson poem mean I am sure to find great discussion points for our middle primary students. Now it is Charlie who retreats into his home and when Oscar looks out in the evening the chair on the verandah is empty. It takes enormous courage for Oscar to step outside and make his own overture of friendship. At its heart In the evening is about our need for connection. The opening words of this book are written like a poem. “In the evening, cars rumbled into driveways. In the evening, window lit up. In the evening, chimney tops puffed. There are some wonderful books in this section – Picture book of the Year and only six will make up the short list but I do hope In the evening will be selected because it deals with issues which at time confront all of us – the need for connection and the confusion of shyness. Over the next few days I will discuss some of the other books in this category. Here is a review of In the evening and another with some extra details about the art found in this book. Here is the web site for Edwina Wyatt. 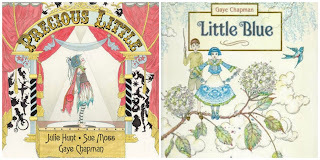 You can see the covers of two other books in our library with beautiful illustrations by Gaye Chapman. If you share this book with a younger audience you might compare it with the series of books about Bear and Mouse by Bonnie Becker, the books about Mouse and Mole, Those Pesky rabbits, and the Bear and Chook books. Posted in In the Evening Reviews, UncategorizedLeave a Comment on Special thanks to Momo! My daughter has been carrying this book everywhere and that’s okay because I love reading it over again. 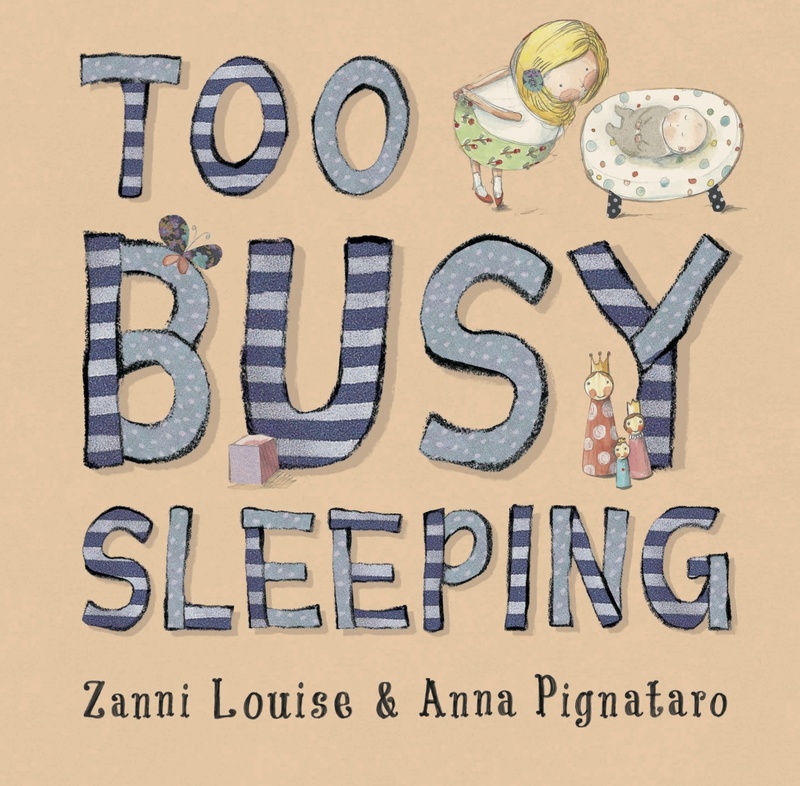 This elegantly beautiful new Australian children’s book is a sumptuous delight. Enchantingly poetic wording from Edwina Wyatt is brought to life through the soft-coloured magic of illustrator Gaye Chapman. This is a collaborative team to watch. In the Evening is a book that charms from the outset. Beginning with an excerpt from Emily Dickinson, we are swept into a twilight world of silvery blue hues and pale pink clouds. Here live Oscar and Charlie, two neighbours who have not yet formed a friendship. As the backdrop dwells on that time between day and night, so Oscar and Charlie’s relationship hovers somewhere between strangers and friends. Ultimately, this is a story about the shyness we all feel when meeting new people. Have you ever had a moment when you just didn’t know how to respond to a stranger’s hello and found yourself ignoring them? Oscar has. When Charlie says hello, Oscar just doesn’t know what to do and those awkwardly shy moments just keep escalating each evening. This is a story about tricky social moments and how they can flourish into friendship with a little courage. What I love about this book is the delicate touch with which that message is applied. You’ll find no blatant ‘and the moral of the story is…’ scenes in this tale. In the Evening is perfect for reading when your child is starting at a new school or anywhere they might encounter new social groups. Available through Readings with free shipping across Australia. Highly recommended. I loved the text in this book – it is a lovely story of the discovery of friendship between Oscar and Charlie, despite the anxious misgivings of Oscar. Their isolation from one another eventually is overcome by simple acts of kindness, even though they are not initially well-received. They both become concerned for each other – without ever having met. The poetic start to the first few pages allows a tender introduction to the difficulties of the characters living relatively lonely and separated lives. However, the illustrations could have done so much more in connecting this gentle plot-line to a child’s understanding. The illustrations are inspired by an Emily Dickinson poem: ‘There’s a Certain Slant of Light’ and are atmospheric, muted interpretations of the text using watercolour washes and eccentric pencil drawings of animal characters with a few ‘splatters’ of light added. Although I admire the intention, I am surprised the Publisher and/or Illustrator did not aim for a more realistic visual portrayal that children could connect to more easily. Overcoming anxiety and beginning a friendship with a shy friend would have resonated so much more obviously with a more realistic choice of illustration style, although I recognise the ‘poetry’ of the image as well as the lyrical text. Worth reading for the beauty of the writing alone. The illustrations are what struck me first about Edwina Wyatt’s hardback picture book In the Evening. Gaye Chapman’s fine line drawings give the book an enchanting, whimsical feel, producing a sense of pastel-hued, cold evening light that sparkles with snowflakes, delicate clouds and showers. The story is about an unlikely friendship that develops between two squirrels- Oscar, who is very shy and Charlie, a bold, outgoing little fellow. In the evening, as shoes shriek in hallways, pots and pans bubble and curtains are drawn, Oscar tends to huddle inside at his window, watching the sights and listening to the sounds outside. Charlie, though, spends a lot of time in the open air, sometimes on his verandah and sometimes swinging in his tree, all the time nodding and waving until night comes. When, at his window one evening, Oscar sees Charlie waving to him, his heart thumps. He doesn’t know what to do. So he ignores Charlie. Over several evenings, Charlie continues to try to start up a friendship with his shy neighbour, but Oscar does all sorts of things to avoid him. Finally, Oscar shouts at Charlie to leave him alone and retreats further into his house so that Charlie can’t see him. Charlie stays away, in fact he stays inside and can no longer be seen in his tree waving. Before long, though, shy Oscar misses his neighbour. He listens and waits…to no avail. It is now up to Oscar. At last he gathers his courage, leaves his house and knocks on Charlie’s door…whereupon a wonderful friendship begins. This is a fine book, gently demonstrating that new horizons can open up if we face fears and meet people halfway. The enchanting story shows young readers that friendship can develop between anyone, even if there are some rocky times…but for friendship to blossom it needs us to reach out. ‘In The Evening’ is a subtle and gentle ode to friendship, and stretching beyond our capabilities. Oscar and Charlie are neighbours. But when Charlie extends a hand of friendship, Oscar is not so sure what to do with himself. Gaye Chapman has created a magical and whimsical world with Edwina’s words. Edwina is another lovely book person I was fortunate to connect with on Sunday at Writers In The Park Festival. This is Edwina’s first book, and she has more beautiful books to come! 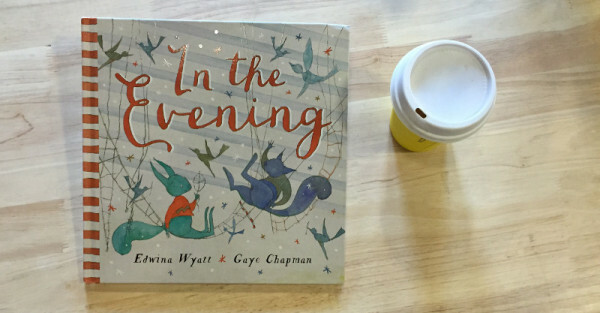 ‘IN THE EVENING by Edwina Wyatt & Gaye Chapman (Little Hare). Oscar and Charlie are different – one shy,the other bold. Through this delightful book over the course of a week, their friendship develops and an all-night party cements their relationship. Oscar is a quiet little character. When evening falls, he’s content to sit at his front window and simply listen and watch. Charlie is far more outgoing. He likes to sit outside on his verandah, nodding and waving at all the goings-on as darkness falls. One evening, Charlie gives Oscar a friendly wave. Oh no! What should quiet Oscar do? He’s not sure so he pretends not to notice. Charlie doesn’t give up. On Tuesday he says hello. Oscar hides. On Wednesday, Charlie sends over a paper plane. Oscar ignores it. Will Charlie keep trying to be friends? Will Oscar finally find the courage to respond? In the Evening is a sensitive story about the complexities of friendship. It’s not always smooth sailing. Different personalities react differently, and perhaps need to approach friendship in different ways. Sometimes misunderstandings arise. Sometimes rocky patches need to be endured for lasting bonds to form. 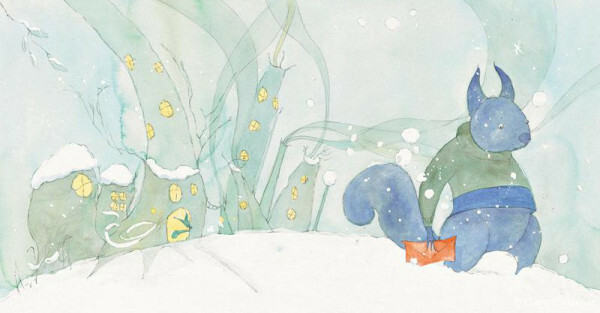 The sweet simplicity of the narrative is complemented by whimsical watercolour and pencil illustrations that bring introvert Oscar and extrovert Charlie delightfully to life in a soft, wintry palette. This is a gentle read, perfect for bedtime. Recurring uncertainty is expressed in the repetition of the line, “Oscar didn’t know what to do” – a feeling every child and every adult will know. But the cycle is broken with a gesture of outreach. Oscar begins to “hope” for more signs of friendship from Charlie, and makes a move. A “knock, knock” on Charlie’s door, and a “hello” lead to an evening of delightful conviviality.